Mar del Plata is the most important tourist resort in Argentina. It is in the province of Buenos Aires and has a population of about 580.000. Besides the tourism activity, it is an important commercial and financial center. Fishing is particularly important in this city and it also involves significant fish processing industrial activities. There are also important foodstuffs, clothing and metalworks industries. Located 400 km away from Buenos Aires, which is reached via a freeway, it is also well connected with the interior of the Pampa region through various highways. The city is served by the Ferrosur Roca railway and the Camet international airport has domestic services and international. It is the homeport for an important sector of the fishing industry although this has been affected by increased fishing activities based on patagonian ports to the south. On previous years and due to lack of depth maintenance in access channel, general trade diminished substantially. Ongoing dredging works are regaining the port’s operational capabilities. There are considerable domestic movements of fish and petroleum by-products as well as small amounts of imports. Plans are to extend pier 3 abt 160m eastward, and to construct piers 8 & 9. (between 7 and 10). Pilots recomend anchoring about 2 miles NE of Southern breakwater in a depth of 6/7 fathoms with not less than 5 shackles. Holding ground reported good. Masters are advised that any bad weather usually comes from the S/SE´ly direction in which case weighing anchor and putting out to sea is recommended. This is approximately 1200 meters long, 100 m wide at entrance, presently as per Boletin Fluvial – July 2012 with a maximum depth (datum) at exterior channel abt 12 m, minimum 9,5 m (31 ft) in internal channel. Ante-port minimum depth 8,50 m (27´ 11´´). The port is sheltered by two breakwaters. The northern arm of 1100 m running in a NE´ly direction; width between breakwater heads about 400 m. Masters must consult Agents regarding updated depth on both channel sections. Of not more than 1 knot can be felt close to shore; with a rising tide in a northerly direction and with an ebb tide in a southerly direction. At datum (see Access channel and description of berths). Max permitted LOA 180 m. On request, Prefectura Naval (Coastguard) may allow LOA´s longer than indicated. Maximum draft 9,50 m, otherwise according to tide with UKC 1´ in static conditions. If sea not calm then an additional allowance equal to half the height of the waves on the bar must be made. In Basin C, depth at datum is abt 9,50 m with bottom soft mud. Vessels load to up to 9,50 m SW draft basis lying aground at low water as necessary and sailing on high water with calm sea. Night time sailing subject to Prefectura Naval (Coastguard) approval, as also sailing with breeze of more than 25 Kph. Port is closed when winds exceed 43 km. 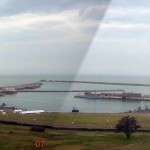 Mar del Plata Prefectura Naval Radio L2O, L2R and L2T RT 500 Khz and 2, 3, 4, 5, 8, 12, 16 Mhz. Also L2U VHF ch 9, 12, 14, 16, 26 and 27; also GMDSS. Additionally it has Radiotelephony service HF/SSB on 2, 4, 8, 12, 12 Khz. Compulsory. The pilot boards vessel in the roads about 1,5 miles NE off the southern breakwater. Pilotage services as elsewhere in Argentina are offered by private agencies. Two available of adequate bollard pull. As per standing regulations, use of two tugs for vessels entering, departing or shifting is compulsory, with following exemptions:1) Vessels with LOA less than 100 m are not obliged to use tugs. 2) Vessels of LOA 100 m – 120 m are required to use one tug. 3) Vessels over LOA 120 m are required to use two tugs. Depending on prevailing conditions Prefectura Naval (Coastguard) may allow a tolerance of 5% on the above figures. The ruling on this point is ambiguous and agents should be consulted. Vessels of LOA exceeding 120 m, berthed bow out at the tanker berth, or in Basin C or at Pierhead C, berths 7, 12 and 13, and if fitted with bow thruster, may sail using only one tug. Private clinics and hospitals are equipped to provide comprehensive medical attention. Rooms available throughout the year in 1 to 5 star hotels. Mar del Plata is connected to Buenos Aires and other cities by good roads with daily bus services. Regular daily flights to Buenos Aires and other cities from nearby domestic airport, also passenger train service to Buenos Aires. Supply of Fuel oil, IFO, Diesel oil and MGO usually delivered by trucks from La Plata or Buenos Aires. It is advisable to request supplies well beforehand to allow sufficient time to arrange transport and customs formalities. If required, vessels of up to 7 m SW draft and LOA 120 m can bunker directly at the tanker berth (Posta de Inflamables). 2 private firms work locally with trained personnel. Presently 7 mobile cranes of up to 90 ton SWL belonging to private operators available. At basin “B” there is a slipway for vessels up to 50 m LOA and 700 ton displacement, and at basin “A” a synchrolift for vessels up to 40 m LOA and 400 ton. (See also pier 7 floating docks). Is available from quay, rate of supply is very slow. Required, but not available and must be provided by the vessel, except at Grain Elevator Berth where fenders are installed. Compulsory for foreign¥flagged vessels over 2000 GRT. Discharge to shore using refuse skips can be arranged if sufficient preadvise given. Available in port area. (See remark ref Container Storage at Basin C Berth 9 and 8). No bonded warehouses in port area, however non customs controlled warehouses available outside the port. Service available by private firms. Available by private firms. Can be discharged via road tanker. Early advise and special permission required. Victuals available in any quantity. Stores, local, not imported, available.